Can Northwest Plaza Be Saved? 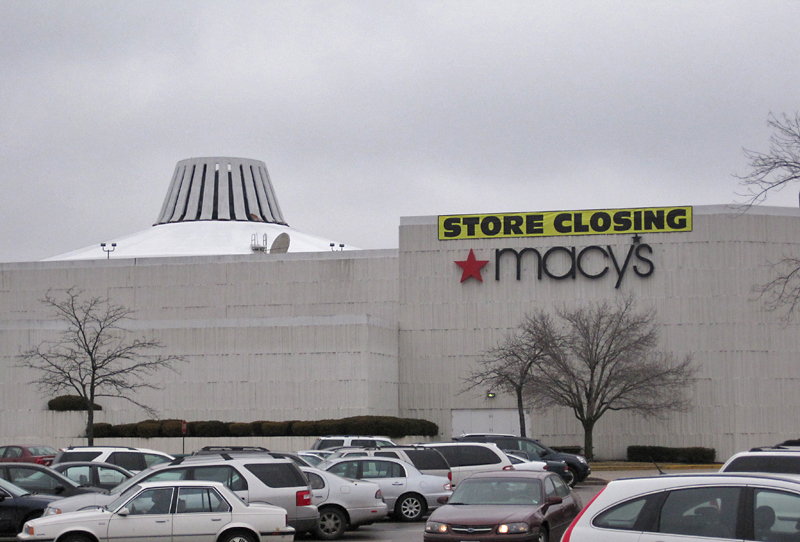 The news that Macy’s is closing its Northwest Plaza store marks the sound of the footsteps of a dead mall walking. The fate of both the former Famous-Barr department store and Northwest Plaza makes me ultra sad, and even before this news I was always nostalgic for the Northwest Plaza of old. It once had energy and personality, then someone decided to put a lid on it. It’s been a slow suffocation ever since. My deep fondness for the Famous-Barr at Northwest Plaza stems from one exact moment in time, and it radiates out from there forever more. November 1978, Olivia Newton-John releases the album Totally Hot. It was a calculated move to capitalize on her “bad Sandy” from Grease. The songs were the most rock she’d ever be, and it was matched with a look which was a modern-day continuation of the 1950s black leather look that had ended the movie my friend and I had seen 7 times in the movie theaters that summer. Some of the songs on this record were more guitar driven, the vocals randy and tough, and to a long-time Livvy fan (Nerd Alert: I belonged to her fan club years before Grease) it was revolutionary. Just as important as the music (which still sounds just as great today, thanks to the brilliance of producer John Farrar) was the album cover art work. I had just turned 13, and had been given the go-ahead to wear make-up to school, and this is exactly how I wanted to look! 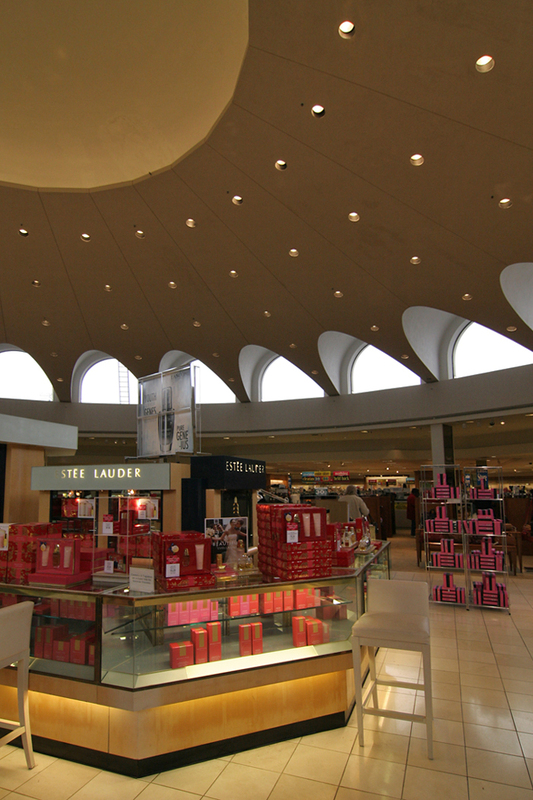 A Friday night in December 1978, I was dropped off at Northwest Plaza, and I trudged through the snow to get to the very spot shown above: the Estee Lauder counter at this Famous-Barr. Where else would a newborn teenage girl go to get that smokey-eyed Livvy look? I stared down through the glass case at all the eye liner pencils, and my heart pounded with excitement at this whole new world of possibility before me. Then a sales lady asked how she could help, and my head started pounding with fear because I had no clue what to say, what to do. I was only used to using the products in my Mother’s make-up drawer, not buying my own! The sales lady was very kind, and after a swift transaction, I walked away with a fat Estee Lauder eye liner pencil of a deep blue-gray. It was my first make-up purchase, my first adult thing, and I still remember the smell of the winter air as I walked out of the store, and turning to look back inside at the warm glow of a cosmetics department that had accepted me as one of their own. Even then, I knew it was a milestone girl-to-woman moment. As most teenage girls tend to do at the start, I too often left the house looking like a hussy raccoon. I abused that pencil something fierce, and still never came close to looking like Lovely Livvy. I do believe that the stub of that inaugural eye pencil still exists in one of my junk piles, holding onto it because that time resonated so deeply. And so does the place that it happened at. Which is why I went there today, to take one last look around, take some photos, and see if the Ghosts of Shopping Past still float under that majestic, astro ceiling. Today was also a gathering of the Facebook groups I Hung Out at the Northwest Plaza Fountain as a Teenager and Let’s Revitalize Northwest Plaza Now! As a person still grieving from the death of Northland Shopping Center, I had to join both groups and then get a look at the people who were foolhardy enough to try and save a dying mall. I was there around 1:30, so didn’t get to see what was eventually about 300 people, as reported by NOCO StL. But Northwest Plaza is so scary dead that seeing the healthy handfuls of people already gathered at the spot where the fountain once lay was heart-warming. Putting a roof over this outdoor plaza was a bad idea from the start; back in the day, I don’t recall a single soul agreeing that this was just what the place needed. But this is what the then-owners felt was necessary to keep up with the Retail Joneses, that shoppers want a hermetically sealed environment more than they want personality and ease of access that comes from open-air malls. With millions of dollars of renovation, they erased the low-slung, mid-century midwest ease that changed with the seasons for a clinical, soulless, Any Town U.S.A. warehouse. I have a sharp, instinctual sense of direction, but once they put the roof over Northwest Plaza, I got lost (as in “will this be an anxiety attack?” lost) every time. I’d try to use the anchor stores as place reminders of the old layout, but it was all so tall and bland and disconcerting, that I’d get discombobulated. The jagged contrast between what it used to be and what it had become was so depressing that I haven’t stepped foot in the place for well over 10 years. It had nothing to do with crime or location or the types of stores within. It was about being creeped out about walking over the burial grounds of a once-beloved place. Oh, how I long to see even the blurriest photo of those lighted deers that graced the Plaza at Christmas time… Northwest Plaza exists only in memories. This mall that has its name is just a tombstone. I am so ecstatic to see a passionate group of people wanting to save this place that I can taste it, but there’s also a bitter aftertaste. There is very little original fiber left to Northwest Plaza, so only a sense of the place we once loved can be revitalized. Even if future plans do include removing the roof, it still won’t be the Northwest Plaza being honored today, it will just be a new “lifestyle center” hoping to coast off nostalgic momentum. Today also poked at the mental scab I have about the demolition of Northland Shopping Center, another beloved North St. Louis County place that could instantly transport you back to the golden days of yesteryear because it was still in its original state. And because of the era in which it was built, Northland was more architecturally significant than Northwest Plaza. But back in 2002-2003, when news of Northland’s demise was first reported, there was not yet Facebook groups to make people aware of what was happening and spur them into action. And trust that people feel just as passioantely about Northland as they do Northwest; even all these many years on, I still regularly get e-mails from people sharing their Northland memories after they’ve found my cyber memorial. The St. Louisan sense of place is very strong, and we should be proud of that. But back in the pre-social network year of 2003, it was just me and a couple of other mourners who documented Northland’s last days. Even then, I knew trying to save it was a losing game; acceptance and love of mid-century modern architecture was barely stirring, and the idea of trying to save retail is a brand new concept brought about by the deaths of enclosed malls. What was particularly galling was that as the last walls of Northland were being toppled, retail trends were swinging to (or actually, back to) open air plazas. 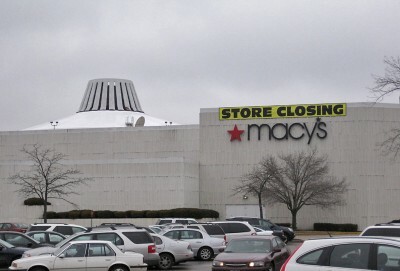 Wow, and they just killed a great opportunity for a retro open air plaza, which could have been the mack daddy of St. Louis lifestyle shopping destinations. 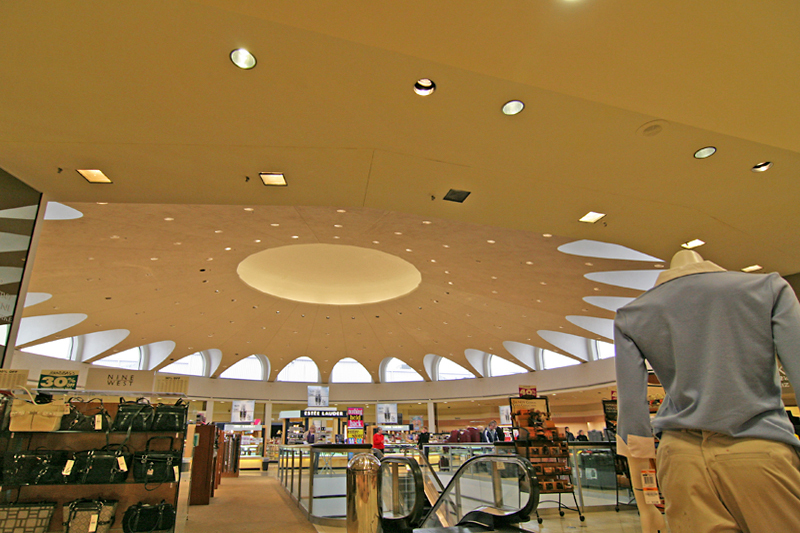 It was also right around this time that the first rumors of removing the roof swirled around Northwest Plaza. This double dose of irony was more than I could withstand and I learned to just let go of any efforts or thoughts of preserving retail because it’s just about following the money which is about following the trends, and obviously, no one cares about retail buildings anyway. These hundreds of people who signed up cyberally and then, today, showed up in person are stirring hope in my heart. Are we ready to embrace sense of place, and ready to expect people-friendly and attractive built environments? Are we realizing how wasteful it is to keep destroying the places of our past for a future with a short shelf life? Regardless of what becomes of Northwest Plaza, I’m just relieved to hear others joining this conversation, and am so proud of St. Louis for taking this stand. You guys rock! 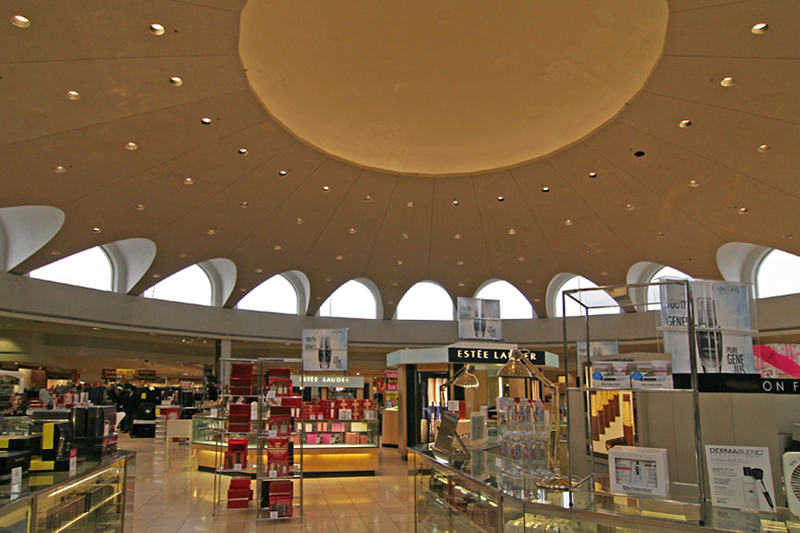 This entry was posted in mid-century modern, north st. louis county, st. louis development, video and tagged Famous-Barr, macy's, northland shopping center, northwest plaza, olivia newton-john, revitalize northwest plaza, st. ann mo by Toby Weiss. Bookmark the permalink. Yup, the mall’s doors have been locked, and it’s officially closed forever. What will happen with the husk of a building that large? The wrecking ball is my guess. Those 120+ acres are too vital to the city of St. Ann, and I hope whatever replaces it goes belly up like the mall did, because those out to save it ONLY want to do so, because of their taxes being so sky high! They don’t care about the current mall. You know what? I’ve been to that mall more times over the last 2 years than over 90% of those living in St. Ann, and I live in MASCOUTAH, ILLINOIS- over 50 miles away!!! I hate to say it, but today only 1 store remains, and the owner is looking to retire soon. When he leaves, nothing will keep the managers from locking the doors forever. That whole mall walk to save the mall should have happened about 5 years ago when it was obvious the mall was going downhill. I went there October 29, 2002- my birthday, and that mall was thriving. It had over 95% occupancy. The old Oshman’s was replaced by the Burlington. It started to drop fast after November, 2003 when the Mills opened. 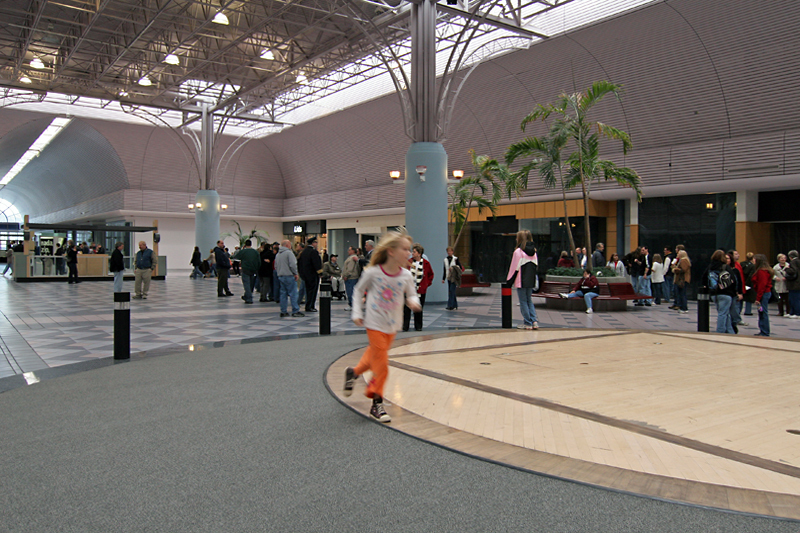 In 2005 when the theater left, that was an obvious sign the mall was not in good shape. Why it takes the loss of Macy’s to get people to come out and cry about saving it when for years they had stopped going there is beyond me. I live over in Illinois, so it’s an ordeal to get there, but as long as I can remember, THE mall to go to when you wanted to go to the mall with the biggest selection and have the most fun was Northwest Plaza. It breaks my heart to see it like this today. I just hope after it closes for good that someone can buy it, and actually turn it back around. If that means to tear part of it down, so be it, but I want to see Northwest Plaza’s name be synonamous with the greatest mall in St Louis again!! Alexandra Burke’s newest song Start Without You is very catchy! The song without a doubt earned the #1 spot on the UK singles charts and I hope Alexandra records her second album soon! I wanna hear Laza Morgan’s new album, too. I am loving your site. It is definitely a trip down memory lane. Northwest Plaza and Jamestown Mall were my hangout malls as a teenager in the ’90s. After college and some living out west I returned to live in the metro east and eventually got out to revisit my old hangouts. The disappointment was almost too much to bear. The movie theater and Tilt were closed, the food court only had 2 stores open, and the only anchor store remaining was the Sears and it was fairly empty. There may have been a total of 5-10 stores left in the whole facility. Jamestown was still surviving, but didn’t seem much better. I almost wish I had never revisited those places so my memories would remain untarnished by what I recently saw. 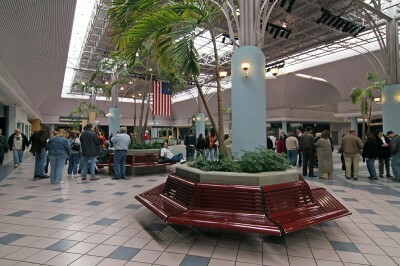 So many memories of NW Plaza. Its where we always shopped. I still remember a good portion of what stores were there and where they were back in the 70’s and 80’s. I loved going there in the winter when it was decorated with the lighted reindeer and the water in the “horse head” fountains was replaced with lights running out of the tops of those stone horses. When you ran in and out from store to store in the snow, you really didn’t care!!! I could go on and on! hey toby i emailed you some old time pics of the place not too long ago. you should have put them up! I think this was where Sally Lucas was last seen. her kid was in a play group with my older sisters. I’ve always been fascinated by this. fodder for my own writing I suppose. Yes, the Sears is still there and open…oddly enough. Is Sears still there or did it close? I was newly married and we were looking for our first house. Saw one on Dixie and the view from the front porch was a huge mud wasteland which our realtor told us was to be a new shopping center. We didn’t buy that house but we did move to north county. 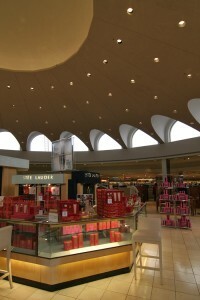 NW Plaza was my most favorite place to shop. I loved the open spacious feel. By the time they closed it in I had moved to south county but I will always have fond memories of NW Plaza the way it was in the beginning, and the way they should have left it. Some things just don’t need “improving”. Great post, thank you. Never has anyone written so beautifully about a mall. I remember when it was an open air mall and then they put the roof on. Another mall heading down the drain. Beautiful writing, Toby. It is always your personal experience of a place that makes me connect with it. In this case, I had a lot of my own to bring to the story that came back as soon as I saw your first shot of the Space Odyssey experience that the Famous-Barr building was. 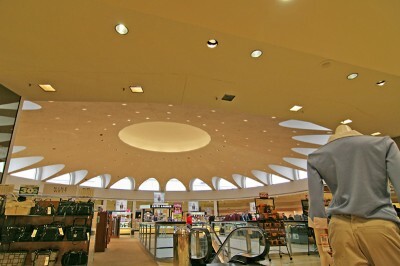 I was only at the covered Mall once or twice, but the Plaza was THE best place to shop for women from Florissant. This Famous-Barr building was where I saw my first celeb. Hayley Mills! I remember her standing on a stage above us, leaning forward and asking all of us kids with our mothers in tow, “Don’t you have school, today?” So, cheers to NWPlaza for giving us our eyeliner and Hayley Mills memories. At least they will last. As a defender of Mid Century Modern here in the Southwest, and having grown up in a MidMod neighborhood not all that far from Northwest Plaza. I was happy to join both FB groups mentioned not long after their start. I hope all these efforts do help to make something that is worthy of what NWP once was. Thanks for coming. We won’t fix this problem tomorrow, but you can rest assured that the work will be done. The mall is over, but this area is just finding its feet again.